The Bridge centre in Clubmoor has become the latest of Liverpool’s digital hubs, launching at an event in November. The centre, which is at the heart of the Norris Green community in North Liverpool, has recently re-opened offering events throughout the day and classes, run by a dedicated group of volunteers led by Su Carson with a wish to make a difference by bringing the community together. TUC unionlearn’s Senior Union Support Officer Laura Robertson-Collins attended, with Liverpool Cabinet Member for Employment and Skills, Cllr Nick Small. The Bridge team. 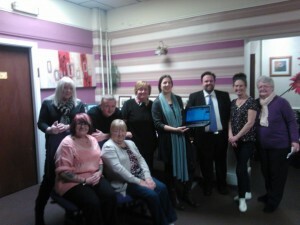 UNISON’s Donna Lomax third from left, next to Councillors Robertson-Collins and Small.